Santa's too busy for you but Captain Falclaus has you covered! I've got a plan to get us all some mad Christmas Spirit! A Secret Santa gift exchange! 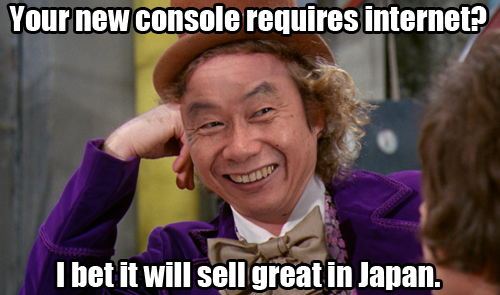 And to make it easier on people without money, this is gonna be creations only. It can be drawings, stories, animations, poems, macaroni art, whatever it is you think that person might like or enjoy. Admittadly it's pretty late in the season to be doing this kind of thing, so to make it easier on everyone, you have until the end of December 31st to make submit your entry. But before all that happens, we need people to sign up! You have until the end of the 21st to sign up (let everyone know so they can get in on it!). Once all the names are listed they will be randomly assigned to another name and the assignments will be handed out. All the gifts must be sent to me, Captain Falclaus, NOT your assigned giftee. Obviously don't make something obscene, illegal, or grotesque. Use common sense. So C'MON let's get into the spirit! Last edited by Captain Falclaus on Thu Jan 01, 2015 7:44 pm, edited 2 times in total. Last edited by McKnackus I on Thu Dec 25, 2014 2:39 am, edited 1 time in total. What I like is VARIETY, so SURPRISE ME. Although if you reeeaaaaally want a proper list, I dunno, Metroid, Mega Man, retro action games in general, robots, extravagant monsters, stuff. Some games I've played recently and enjoyed thoroughly include Xeodrifter, Volgarr the Viking, Super Time Force Ultra, as well as old favorites like Awesomenauts, Dark Souls, and DotA 2. You still get more points if you just surprise me, though. Oh, okay, things I like, huh. Last edited by Pikmanipulator on Thu Dec 25, 2014 2:29 pm, edited 1 time in total. Oh, one thing I forgot, please provide a list of things you like, so your gift giver can make something that appeals to your interests! Once everyone updates their posts signups will be closed and assignments will be sent out. Sorry about this, next year I will have this more organized. YES! Signups closed. Assignments will be sent out in a flash! Listen to this while reading for best results. I see you like Donkey Kong Country! Good taste! Here's my gift to Elby. HERE'S MY THING. Sort of. I realized I was going to be hella late, and rather than just delaying it forever, I figure I'd just finish up what I did have so I have something to show for the time being, expect more to it later. And no, it's not just one of those things with a bunch of different expressions for the character (although that's where the base idea comes from, obviously). Feel free to just consider this the full present and I can say the full version is an early/late birthday present, or something, or just something for the heck of it. HYES! Captain Falclaus' Secret Santa Gift Exchange Extravaganza 2014 is in the books with record attendance! Good job on the gifts everyone! Wow, I did not expect that at all! But it works, since coincidentally I watched a few episodes of the old TMNT show and I indeed remember Krang. No problem Pikman! I just knew I had to draw some kinda of DK pun eventually. And thanks for the headshots LB! You should draw more things! I SHOULD. I really should, but I'm bad, and slow. Mostly bad. Totally didn't wait to start until the 31st. Also, Pikman's gift to myself, is that from something specific, or did you just go all out with the "surprise me" suggestion? I'm definitely cool with it either way, just wanted to be sure there wasn't some reference I wasn't getting/forgetting/??????????????. From the sugarlands, humanoid girls made of candy with feline ears and tails arise. Their skin is various kinds of colorful sugar with different colors of liquorice hair, peppermint eyes, gumdrop ears, and a gummy worm tail. They are very peaceful creatures that only eat the lands candy and the apologize to the land for what they take, now isn't that cute? Obviously I took some creative liberties. But it was all done to surprise you. Fun fact: I had actually decided to draw them before I was assigned you as my recipient, or even before I saw your list of likes, which coincidentallly asked for a surprise. I guess the stars just aligned for me this Christmas. OH, candy, I don't know how my brain didn't make that connection, I just saw it as some weird bright cartoonish cats with some sort of crazy hypno eyes. So hypnotic that I apparently missed all the obvious cues. Yeah, that's pretty neat. Oh yeah, I almost forgot that I even came up with names for the three candy cats. 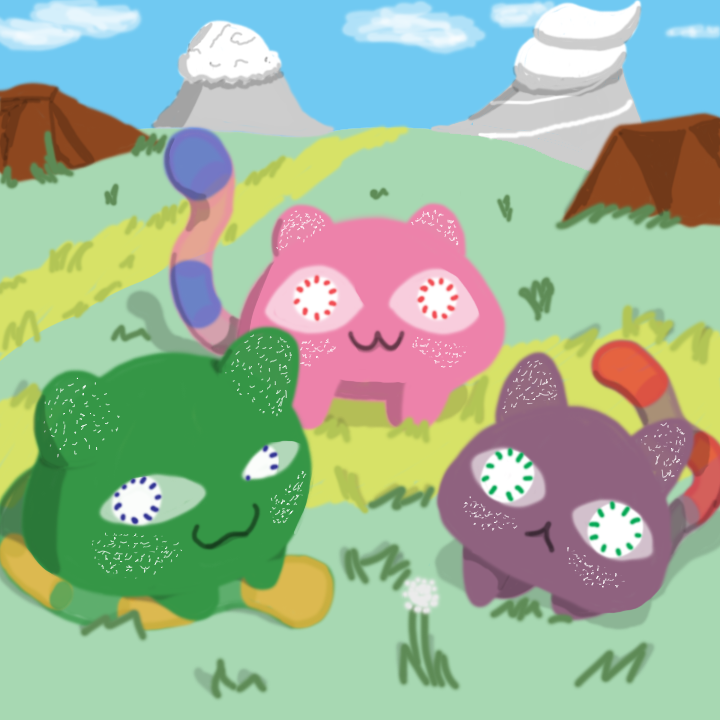 The pink one is Nyaomi, the green one is Chubchub, and the purple one is Amekyss. Now I'm just wondering who Captain Falclaus was. It was the butler in the dining room with a steak knife.